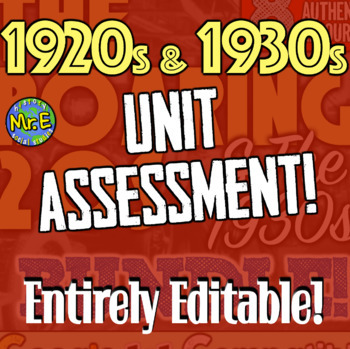 1920s and 1930s Assessment: Two-Part Test for Events of Roaring 20s and 1930s! 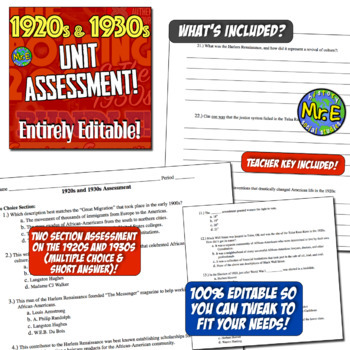 In this purchase you receive a fully editable assessment to be used for content on 1920s and 1930s in the United States. Use to measure understanding on the Great Migration and the Harlem Renaissance, the Tulsa Race Riots and Black Wall Street, Alice Paul and Women's Suffrage, the Red Scare, the Teapot Dome Scandal, the Market Crash of 1929 and the Great Depression, and much more! 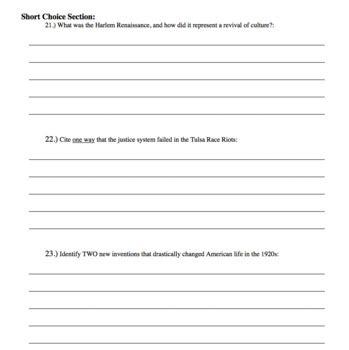 This two-part exam quizzes students in both multiple choice and short answer format. Since this is 100% editable, you can easily tweak to fit your needs!